ANNAPOLIS, Md. (CNS) — The Catholic Church’s objection to the death penalty comes from its consistent teaching that life must be protected from conception to natural death, said Baltimore Archbishop William E. Lori. “At the core of all of (the church’s) public witness is an evident consistency that reflects our reasoned belief that every human life is sacred and to be protected, because every life comes from God, and is destined to return to God as our final judge,” he said. 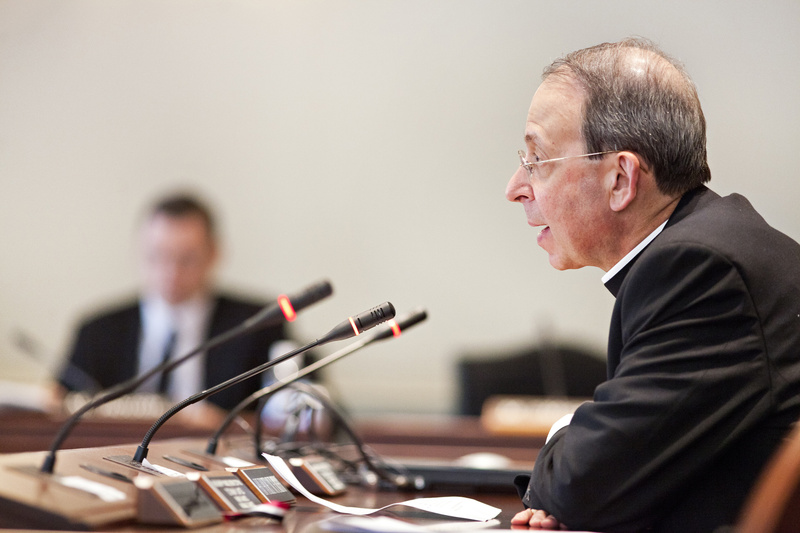 Archbishop Lori said that view compels him to advocate against Maryland’s death penalty. He testified Feb. 14 to support a proposed repeal of Maryland’s death penalty at back-to-back committee hearings in the state’s Senate and House of Delegates. His testimony followed Gov. Martin J. O’Malley, who also spoke in support of the repeal bill he introduced. Other Maryland officials also testified as part of the governor’s panel. “While those who have done terrible harm to others deserve punishment, we urge a response that meets evil with a justice worthy of our best nature as human beings, enlightened by faith in the possibility of redemption and forgiveness,” he said. In his testimony, Archbishop Lori expressed “respect and compassion” for victims’ families, and urged lawmakers to devote more resources to helping them. “I hope my presence today conveys to you a sense of how important this issue is to the Catholic Church,” he said. “We also have the example of Blessed John Paul II, who many times intervened before the execution of someone on death row. I think that should also speak powerfully to us,” he said. The death penalty, along with gun violence and abortion, topped the issues Maryland Catholics discussed with their state lawmakers Feb. 18 during the Maryland Catholic Conference’s annual Lobby Night. Archbishop Lori, Bishop Madden and Baltimore Auxiliary Bishops Mitchell T. Rozanski were among the state’s bishops’ who attended the event. The event began in the afternoon at St. John Neumann with prayer and briefings from the catholic conference’s staff on legislation related to pro-life issues, education and social concerns. Following the presentations, Catholics met with their lawmakers to advocate for laws reflecting Catholic social teaching. What an odd term for a Catholic to describe tradition. The New Testament death penalty support is overwhelming. There is a 2000 year record of Catholic Saints, Popes, Doctors of the Church, religious leaders, biblical scholars and theologians speaking in favor of the death penalty, a record of scholarship, in breadth and depth, which overwhelms any position to the contrary. The very recent changes (EV,1995 & CCC, final amendment 2003) in the Catholic position are based upon a wrongly considered prudential judgement which finds that “defense of society”, a utilitarian/secular concern, not a moral or theological one, very rarely, if ever, requires execution. This change in teaching is based upon the Church’s switch to utilitarianism – defense of society – when the teachings have been and must be based upon justice, biblical and theological teachings and tradition – all of which conflict with the newest teachings based upon utility — as utility and justice may, often, have conflicts. In addition, the evidence is overwhelming that execution offers greater defense of society than does a life sentence. Dead unjust aggressors are infinitely less likely to harm and murder, again than are living unjust aggressors. Living unjust aggressors murder and harm in prison, after escape and after improper release. The cases are well known and are daily occurrences. It is a mystery why the Church chose a utilitarian/secular prudential judgement over eternal teachings based upon justice and chose to spare more murderers at the cost of more innocent deaths, but that is, precisely what She has done. It is also a mystery why the Church didn’t review the available evidence, that execution offers a greater defense of society. There is no evidence that She did. Thankfully, as the recent Church’s teaching is a prudential judgement, such means that any Catholic can support more executions and remain a Catholic in good standing. Catholics should inquire, why is removal of the death penalty option “preferred”. 1) 2000 years of Church teachings are in conflict with a secular/utilitarian “defense of society” foundation. Why aren’t the prior 2000 years of teachings “preferred” and/or Why aren’t those 2000 years of teachings “preferred” over a secular prudential judgment? 3) The facts support that the death penalty must be a greater defender of both society and innocent individuals, than is incarceration? Why is a lesser defense of society, which allows more innocents to be victimized, more “preferred’? This is in the context of death penalty eligible crimes, in proportionality and within Church teachings. God/Jesus: ‘Honor your father and your mother,’ and ‘Whoever curses father or mother must certainly be put to death.’ Matthew 15:4 NAB. This is a frequent passage which God used in the OT, which, as was Jesus’ custom, He brought into the NT for emphasis of continuity and importance. Pope (and Saint) Pius V, “The just use of (executions), far from involving the crime of murder, is an act of paramount obedience to this (Fifth) Commandment which prohibits murder.” “The Roman Catechism of the Council of Trent” (1566). All interpretations, contrary to the biblical support of capital punishment, are false. Interpreters ought to listen to the Bible’s own agenda, rather than to squeeze from it implications for their own agenda. As the ancient rabbis taught, “Do not seek to be more righteous than your Creator.” (Ecclesiastes Rabbah 7.33.). Part of Synopsis of Professor Lloyd R. Bailey’s book Capital Punishment: What the Bible Says, Abingdon Press, 1987. Quaker biblical scholar Dr. Gervas A. Carey confirms: ” . . . the decree of Genesis 9:5-6 is equally enduring and cannot be separated from the other pledges and instructions of its immediate context, Genesis 8:20-9:17; . . . that is true unless specific Biblical authority can be cited for the deletion, of which there appears to be none. It seems strange that any opponents of capital punishment who professes to recognize the authority of the Bible either overlook or disregard the divine decree in this covenant with Noah; . . . capital punishment should be recognized . . . as the divinely instituted penalty for murder; The basis of this decree . . . is as enduring as God; . . . murder not only deprives a man of a portion of his earthly life . . . it is a further sin against him as a creature made in the image of God and against God Himself whose image the murderer does not respect.” (p. 111-113). Prof. Carey agrees with Saints Augustine and Aquinas, that executions represent mercy to the wrongdoer: “. . . a secondary measure of the love of God may be said to appear. For capital punishment provides the murderer with incentive to repentance which the ordinary man does not have, that is a definite date on which he is to meet his God. It is as if God thus providentially granted him a special inducement to repentance out of consideration of the enormity of his crime . . . the law grants to the condemned an opportunity which he did not grant to his victim, the opportunity to prepare to meet his God. Even divine justice here may be said to be tempered with mercy.” (p. 116).”A Bible Study”, Essays on the Death Penalty, T. Robert Ingram, ed., St. Thomas Press, Houston, 1963, 1992. It is not the nature of our deaths, but the state of salvation at the time of death which is most important. The power to execute comes directly from God. Fiery hell is a considerable more severe sanction than any earthly death. The Holy Spirit, God, through the power and justice of the Holy Spirit, executed both Ananias and his wife, Saphira. Their crime? Lying to the Holy Spirit – to God – through Peter. Acts 5:1-11. No trial, no appeals, just death on the spot. For murder, there is no mitigation from a death sentence.